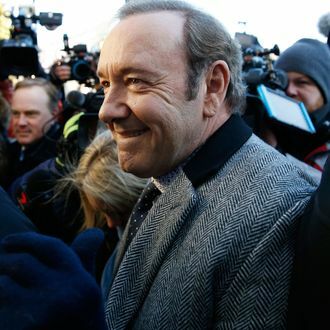 Kevin Spacey was in and out of his first court appearance in Nantucket, Massachusetts, in under 30 minutes today. He’s facing charges of one count of indecent assault and battery. Per reporting from CNN, Spacey arrived with two lawyers in tow at the Nantucket District Court — despite his attempt to avoid an in-person appearance — for his scheduled 11 a.m. arraignment. In court, some moments which can be viewed in the video below, the prosecution was granted its request for Spacey to “stay away” and have “no contact” with his alleged victim and his family. Spacey, who did not talk throughout the arraignment, nodded when the judge imposed the request. Spacey did not enter a plea in the courtroom, although CNN notes, per “the clerk’s office,” that a plea of not guilty was entered on his behalf earlier today. Spacey’s next hearing was set for March 4, and the actor does not have to attend. Spacey’s charges stem from a criminal investigation lead by the Nantucket Police, which occurred after Heather Unruh, a former news anchor, alleged Spacey groped her unnamed 18-year-old son at one of the city’s restaurants in July 2016 while they were drinking. “Kevin Spacey had no right to sexually assault him,” Unruh said at a press conference at the time. “There was no consent.” Spacey has since been accused of sexual assault by multiple men stateside and overseas, with numerous investigations launched. As for Spacey, he’s been trying to butter up the paparazzi and his fan base. Update, January 8, 9:47 a.m.: Spacey’s litigious week continues to get worse, although he was able to walk away from this one without a penalty. Per the Washington Post, the actor was pulled over for allegedly speeding while leaving the Reagan National Airport in Arlington, Virginia, on Monday evening. Spacey was given a verbal warning and not a ticket. “This incident was unique because he was being followed by people,” a Metropolitan Washington Airports authority said, referring to the numerous paparazzi vehicles that were tailing Spacey’s car.